Summary: This tutorial teaches you how to delete call history on Android phone step by step. With this detailed tutorial, you can easily remove call logs from Android phone or permanently erase call logs on Android phone without any chance to restore. When you make receive or miss a call, you will see the new call history on Phone app of Android phone. To prevent your call history from leakage or to have your Android phone look clean and make more space, knowing how to delete call history on Android is essential and important. Now, let's see how to make it together. You can delete the calls you have made, missed or answered directly on your Android phone, which is a way to simply remove call logs from the list. You can refer to the following steps to remove a single call or all calls from your Android phone. Note: For various Android phone brands or versions, the names of options in the steps might be a little different, but you can still refer to the similar steps as below. - Tap the Bin icon (Delete button) to delete the selected call log. - Tap "OK" option when it asks if you want to delete your call history. To delete call logs directly on Android phone, even though it is easy and available, it is also troublesome when you don't need to remove all call logs from Android phone, or when you need to delete not only one or several call logs from the list. So, to meet your requirement, please read on to find more suitable solutions. To better meet user's requirement, the Android Data Manager (Windows/Mac) is available for you, which allows you delete call logs on Android phone individually, in bulk or wholly at your request. Also, you can check all your call history on Android phone in details (contact name, phone number, date, location, type, duration, etc. ), back up call logs from Android to computer, or import call logs from computer to Android phone as well. Actually, not only Android call logs, you can also use the Android Data Manager to manage other Android data, such as contacts, SMS, music, photos, videos, movies, TV shows, books, documents (PDFs, ePbus, etc.) and more. And this software is fully compatible with almost all Android devices and models, including Samsung, Huawei, Sony, HTC, ZTE, LG, Motorola and more. Now, please download the right version of the program on your PC or Mac, and follow the steps as below to delete call logs on your Android phone. This tutorial takes Windows version of the program as an example, Mac users can refer to the same steps as below as well. Step 1. Connect Android to the program. Launch the program after downloading and installing, and connect your Android phone to PC via a USB cable. 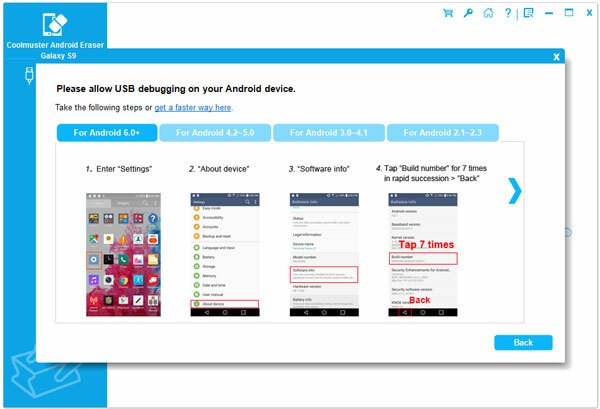 For the first time you connect your Android phone to this program, you need to follow the onscreen prompt to enable USB debugging on your phone, having your device recognized by the program. Step 2. Access and view call logs on Android. When the program successfully detects your phone, the main interface will show as below. You can enter the corresponding file category to preview your phone data. Now, simply click "Contacts" > "Call Logs" to check your call history on Android phone. Step 3. Select unwanted call logs and delete them. While previewing, please mark one or more call logs that you don't want from the list. After selection, simply click "Delete" option and confirm it to remove them from your Android phone with one click. If you need to wipe out the call history from Android phone forever, it is highly recommended to use the Android Data Eraser (Windows/Mac) to permanently delete call history on Android phone without any opportunity to be recovered. This program will overwrite the data on your Android phone, which makes your Android data unrecoverable, so it is a secure way to protect your privacy information from leakage. What's more, not only the call logs, all other Android files are supported to be erased, such as contacts, text messages, notes, photos, videos, accounts & passwords, apps, and many more. Now, please download the right version of the program on your computer and follow the steps as below to wipe out call history on Android phone. Note: Before going further, please be aware that the Android Data Eraser now ONLY supports "Erase All Data" mode, so please do remember to back up all important data on your Android phone in case of unexpected data lost. Step 1. After backing up your Android data and installing the Android Data Eraser on your computer, please launch the program on your PC and connect your Android phone to computer via a USB cable. Then you might asked to install MobileGo connector app on your device, just follow it to have your device recognized by the program. Step 2. One the program successfully detects your phone, all of your phone data will be scanned out. 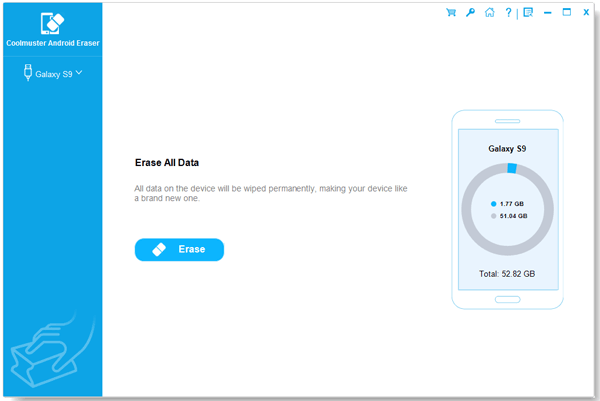 Simply click "Erase All Data" button on the interface and confirm it, thus all of your Android data will be wiped out permanently, including your Android call logs. Now, you have 3 different ways to delete call history on your Android phone, please choose your favorite one to help you clear your Android call history without hassle. If you have any questions about the steps or the programs, please leave your comments as below, we will try our best to solve your problems as soon as possible.